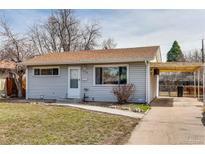 Below you can view all the homes for sale in the Burns subdivision located in Aurora Colorado. Listings in Burns are updated daily from data we receive from the Denver multiple listing service. To learn more about any of these homes or to receive custom notifications when a new property is listed for sale in Burns, give us a call at 720-580-6694. Very nice starter or investment home, centrally located. Schedule you showing today. MLS#4974733. HomeSmart Realty Group. Showings after 4pm, with 24 hours' notice and by appointment only. MLS#9739722. INCOME PROPERTY REALTY. New roof going on end of April MLS#2565030. 8z Real Estate. Easy Access to the Del Mar Park, Lowry Park, Big Bear Ice Arena, Aurora Mall, I-25, I-70 and DIA, 5 Blocks to Elementary School MLS#1942296. COLDWELL BANKER RESIDENTIAL 18. Quiet interior site with Southern exposure. MLS#7502373. RE/MAX Alliance. Lots of new development all around including restaurants and shops. MLS#4542605. UrbanGate Realty Group. Schedule your showing and come see this charming home yourself! ! MLS#2686234. Resident Realty South Metro. You won't be disappointed. Set your showing today! MLS#6258125. RE/MAX Professionals. Ready for you to move in! MLS#2878149. THE RESOURCE GROUP LLC. A home this nice is hard to find at this price and offers are being reviewed as they come in. MLS#8514022. Resident Realty.